After working so hard to achieve a goal, it’s easy to lose your way. Here’s help in shaking off the blues long after the crowds have gone home. Congratulations on just completing your first/10th/35th physique show! But now, after the tan has faded and the outpouring of social-media attention has simmered, you’re left feeling … well, kind of crappy, to be honest. Maybe you overdid it with post-show treats and you’ve quickly put on some unwanted weight, or you feel lost without the goal of the stage looming over your head, or you’ve just lost interest in training altogether. Your friends and family just don’t get it, and all the competitors on your Instagram feed seem to be thriving, so what’s wrong with you? In a word: nothing! It’s the post-competition blues, and it can happen to anyone. Over the last four (or more) months of prep, your body has gone through a lot of changes—physically, mentally, and emotionally. You’ve lost body fat and stuck to a very restrictive diet perfectly for months, and your hormones have taken a hit (sorry, ladies—this is even worse for us!). All of these factors quickly add up to make the perfect storm once the pressure of a deadline is removed, and it can affect everyone differently. You may feel unmotivated, frustrated, mentally and physically exhausted, or even depressed. The term “post-show blues” exists for a reason, and many seasoned competitors will admit to experiencing some level of fallout after the stage lights have dimmed. As you come down from the post-show high, take a minute to develop a game plan to help you through any potential rough spots. As a competitor myself, there are three things I always do to help my body and mind recover in the healthiest way possible. 1. Reverse, reverse, reverse. The reverse diet is vital in helping you feel great following a competition. With the proper balance of macronutrients that gradually increase you back to equilibrium while gradually decreasing cardio, your hormones will be well-supported to keep you feeling your best. If your coach doesn’t supply you with a reverse plan, seek someone knowledgeable to help you with this. 2. Get back to your prep routine. During prep, you were very regimented; your meals, training, cardio, and water intake were all rigorously structured and that kept you in control. Return to a structure to avoid falling off the wagon! Prep your meals for the day so you aren’t tempted to grab fast food, and get back to the gym for training and cardio. Keeping the same habits in place will help you feel normal and purposeful rather than lost and confused. 3. Establish a goal. With the goal of competing checked off your list, what’s next? This is the aspect that usually leaves competitors feeling aimless, but there’s an easy solution: Set a new goal for yourself. It could be making the physical improvements needed for your next competition, booking a photo shoot, or training for something away from the stage. A new challenge can be the motivation you need to stay active. Maybe you want to try a Tough Mudder, a triathlon, or a powerlifting meet. It’s up to you! It takes time for the body (and mind) to return to its pre-prep state in terms of strength, energy, and hormonal balance. Competitors are notorious for being hard on themselves, but now isn’t the time to beat yourself up over these naturally occurring changes. Be kind to yourself and listen to your body right now, even if that means taking an extra rest day or shortening your workouts to improve recovery. 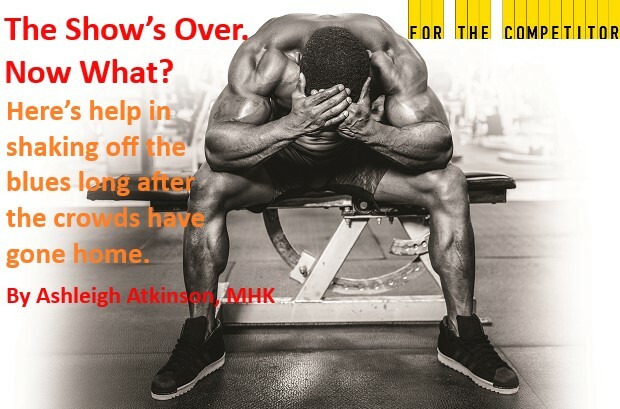 Remember, you just put your body through a major stressor with contest prep. Many symptoms are totally plausible right now, and everyone will feel different. If you don’t quite feel like yourself, don’t stress about it. Feeling abnormal is, unfortunately, pretty normal.